Hordes of ever-stronger orcs, bears, ogres and other, newer creatures such as the dwarf grenadiers, forest giants and Cyclops mages charge towards the players’ fortress. Just as in PvP, the heroes need to defend their own rift making use of their skills and traps. 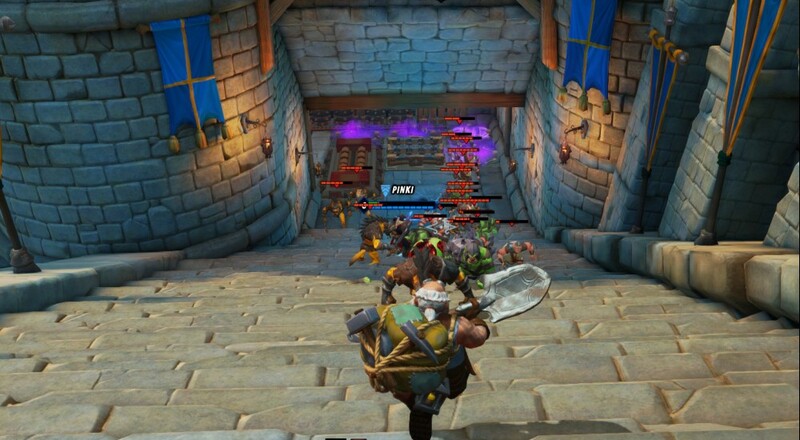 In addition to normal trap construction, during combat there is the chance for players to set up multiple traps before the game starts and the first wave of enemies comes. This then allows player teams to come up with the best possible agreement on placements and increases the tactical possibilities prior to the siege. Players playing in any of the PvE modes will be able to activate "Unchained Mode" (we've got game title, people). During the course of a match, players will fill up an "Unchained Meter" whenever they kill enemies via combos, i.e., utilizing traps and hero damage. Once filled and Unchained Mode unleashed, heroes gain increased health and mana as well as reduced ability cooldowns. Just the kind of thing that's needed when you're in those tense moments and defeat appears to be imminent. Orcs Must Die! Unchained is currently in closed beta mode, though you can create an account and try to get in that way, and is slated for a 2016 release. The game will be free-to-play, meaning you can likely expect some micro-transactions and heroes for money.